View over Novara - A view of the sky above Novara towards NNW. Novara: Basilica S.Gaudenzio - Monte Rosa, 0.4 mi. Biandrate: Traffic A26 - KM 127,7 - A26/A4 itinere nord, 8.1 mi. Ghemme: Traffic A26 - KM 143,0 - Romagnano itinere nord, 14.4 mi. Ghemme: Traffic A26 - KM 146,6 - Romagnano itinere sud, 15.1 mi. Borgomanero: Traffic A26 - KM 151,1 - Borgomanero itinere nord, 15.7 mi. Borgomanero: Traffic A26 - KM 157,9 - A26/D8 itinere nord, 16.4 mi. Stroppiana: Traffic A26 - KM 101,2 - Allacc. A26-D36 itinere nord, 16.6 mi. Gallarate: Traffic A08 - KM 27,2 - itinere nord, 17.5 mi. 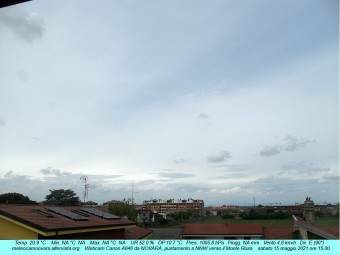 This webcam Novara with the theme Weather was added on December 20, 2011 and is operated by Stazione Meteo Davis di Novara. It got 3571 visitors since then. Shouldn't this webcam work or should the link be wrong please report that here. You can add this webcam here to myCams.